The resulting trial appears to be the excuse they will use to remove her from her IMF post, thus making way for a Chinaman to take the top spot. And removing her for corruption will reinforce the propaganda narrative about the “corrupt” West. > It doubles the amount of funds the IMF can lend out during financial crises, and this will come in quite handy as we enter the emerging market meltdown triggered by the Fed rate hike. > It allows the 15th General Review of Quotas, which had been delayed by Congress’ previous lack of action on the 14th Review, to go forward just as we’re entering the Big Crisis. 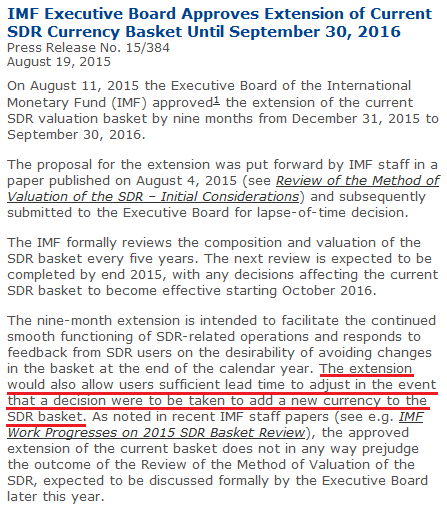 This will allow the globalists to restructure the IMF during the Crisis. > It leaves America’s veto power intact, which will set the stage for the coming climactic showdown between the West and the East over “ownership” of the institution. 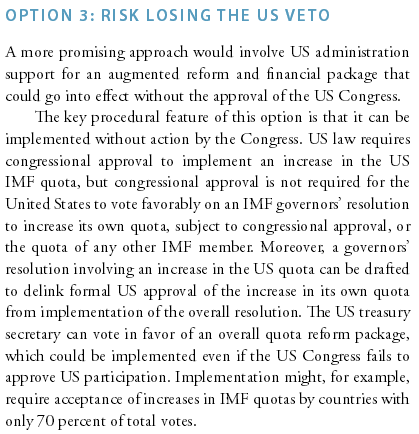 Looking at the last two points, two things seem fairly certain: 1) the 15th General Review of Quotas will leave the US with too small a voting share to have veto power over future IMF decisions, and 2) this will be used as a pretext for the US Congress to oppose its ratification. 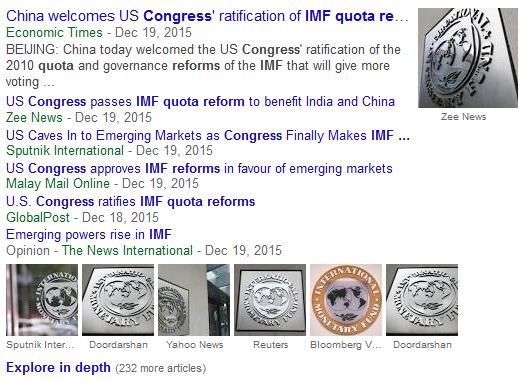 So how will the IMF get around Congress the next time? …The highlighted point is a rather interesting one, isn’t it? 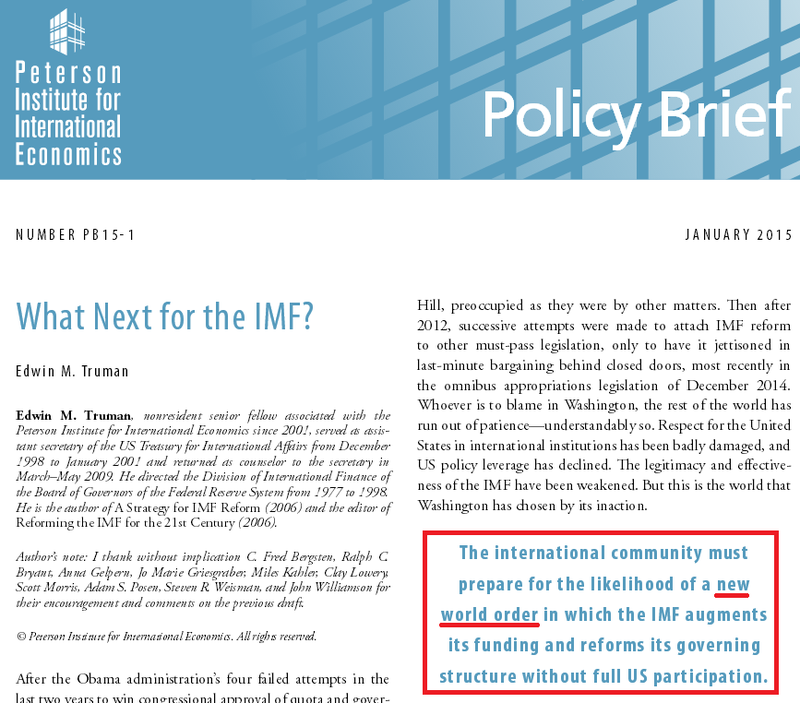 Basically, it calls for the IMF to structure the reforms in such a way that US law is not triggered, thus allowing the Obama administration to vote for the reforms without Congressional ratification. Basically, it calls for the creation of a parallel IMF that is connected to the current one. But unlike the current one, the “SupraFund” would omit US veto power and European “overrepresentation.” And with the rest of the IMF moving away from the West in this manner, the West would be compelled to sign on to avoid becoming isolated. The SupraFund would eclipse the IMF in the same way the G20 eclipsed the G8. Take careful note of the underlined passage. Although this sentence was ostensibly added with the Chinese yuan in mind, it could apply to other BRICS currencies as well. Given the upcoming Big Crisis and the IMF’s need for BRICS gold to give the public confidence in the new system, other BRICS currencies could be added to the basket that takes effect on October 1. At the same time all this is occurring, the US will be gripped by Presidential election politics, and we could see the September prophetic unfolding regarding Obama. So bypassing an America in disarray could be a necessity for the IMF. All in all, it’s gonna be a helluva year. >>> If the IMF membership decides it is necessary to put forward this option, I would hope that the United States would join the SupraFund and accept the hastening of the inevitable day when its capacity to block certain decisions in the IMF has been eliminated because its size relative to the global economy has shrunk. This would be a complex way of implementing that reality, but it is one that should be actively considered given that the United States recently has been irresponsible in exercising its capacity to block a needed, important evolution of the IMF in the form of the 2010 reform package. The impasse over implementation of the 2010 reform package has seriously damaged US leadership and leverage in the IMF with spillovers into other areas of international economic and financial cooperation such as standards governing financial institutions and trade agreements. Partners will increasingly ask: Is it worth doing business with the US executive branch if the US legislative branch will resist or reject resulting international agreements? The impasse also threatens the central role of the IMF itself because its financing and governance essentially have been frozen. This has in turn accelerated the tendency to replace the IMF (and its Bretton Woods twin, the World Bank Group) with other institutions of international economic and financial cooperation in which the United States has little or no influence—such as the New Development Bank (established by Brazil, Russia, India, China, and South Africa with an emergency lending component), the Asian Infrastructure Investment Bank (led by China), the Chiang Mai Initiative Multilateralization (an Asian self-help financing arrangement), and the European Stability Mechanism (a European self-help financing arrangement). These trends promote the further fragmentation of the international monetary cooperation that underlies everything that the IMF does to promote global economic growth and financial stability. This passage sounds very New World Orderish, doesn’t it? So who is behind this “Peterson Institute for International Economics? And who is C. Fred Bergsten? So the guy is a CFR drone and one of Henry Kissinger’s former assistants, and Kissinger is the man who led the Rockefeller project that devised the New World Order implementation plan. And if you look into the backgrounds of Adam Posen (Peterson’s current president) and Edwin Truman (the brief’s author), you’ll find they too have long globalist resumes. All this being said, why does a policy brief from an American economic think tank sound like something written by a BRICS propaganda organ? Because the globalists built the BRICS, and think tanks like this one devise the moves the BRICS will make on the international stage. It’s all a big play put on for public consumption, and guys like these help write the script. Yep, things will indeed drag on for months. And as if by magic, she’ll lose her post right as we hit the NWO transition point and it’s time to put a Chinaman in. This entry was posted in Globalist Agenda Watch 2015, NWO on December 21, 2015 by kenneth.